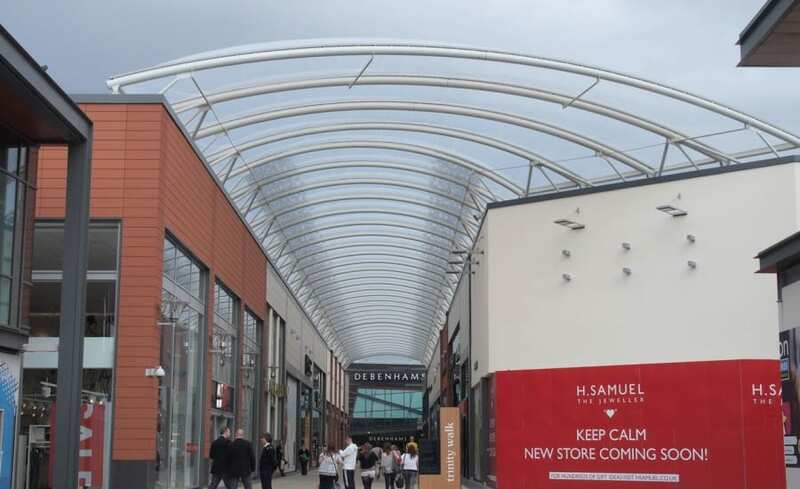 Originally a sculpturally designed ETFE cushion entrance canopy, Architen Landrell was contracted to design, manufacture and install the feature canopy in 2009. The design team was well into the design period when the scheme fell victim to the credit crunch as funding was withdrawn from the project. 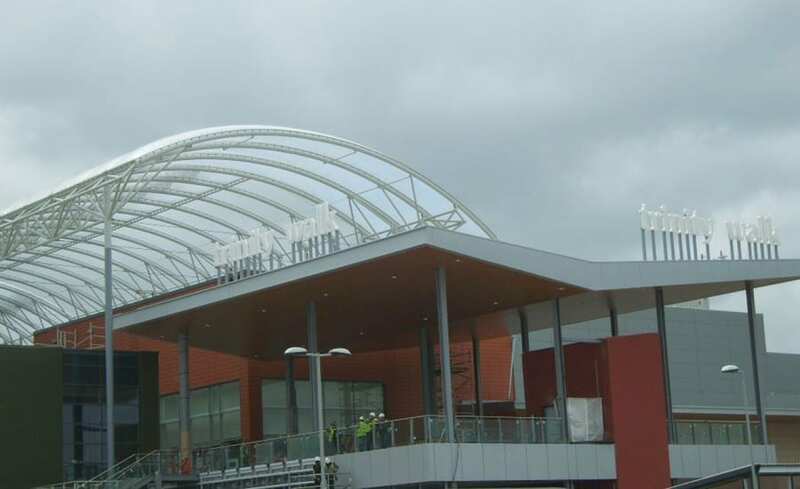 However, in early 2010 the scheme rose from the ashes and a revised design was proposed, minus the feature canopy but with the addition of a 2 layer ETFE cushion roof spanning the shopping centre street. 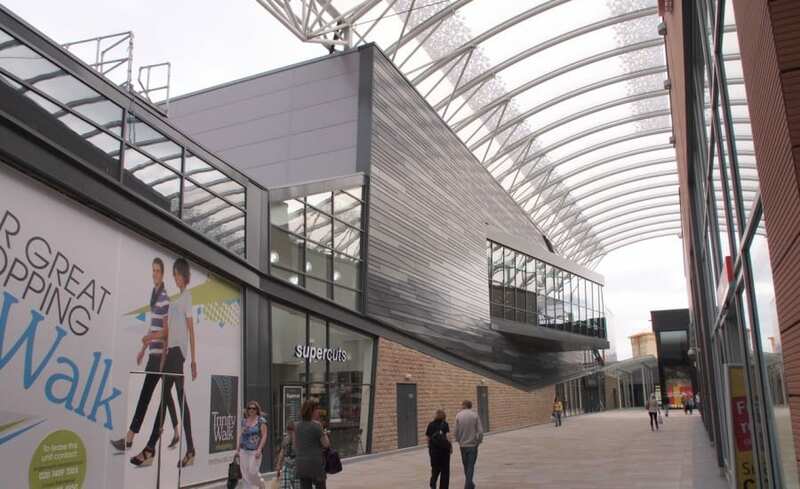 Built on a the modern retail model, the Trinity Walk shopping centre in Wakefield is formed by double-height units arranged along broad boulevards, including the partially-enclosed Main Mall which frames the showpiece Debenhams located at its eastern end. 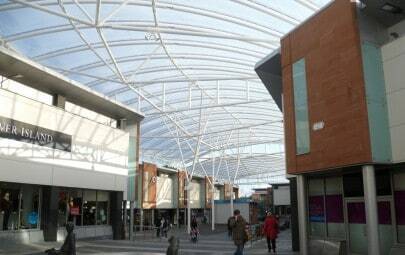 The ETFE roof, installed with a supporting steel structure, spans the L shaped boulevard enclosing the space and protecting the shoppers from the elements while still retaining a good level of natural light. 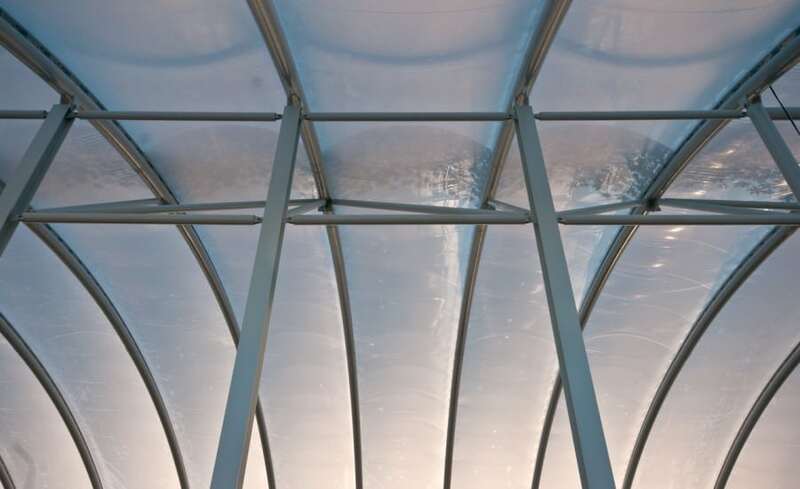 ETFE foil in particular was chosen as the Client was looking for something that had the advantages of glass but at a more affordable cost and in the same instance could be constructed within the timescales and constraints of the project. They needed a structure that would protect the public from the wind and rain but keeping an environment that was light and airy, using natural light. In total, the roof comprises 75 individual cushions, including 13 cushions which form the trumpet shaped entrance canopy, all positioned with a 2m gap between the canopy and the building roof to allow for natural ventilation. The ETFE foil cushions cover a total of 3,150 square metres our largest ETFE structure to date! At the request of the architect, the majority of cushions are fritted, or printed, with a leaf shaped design in silver ink. 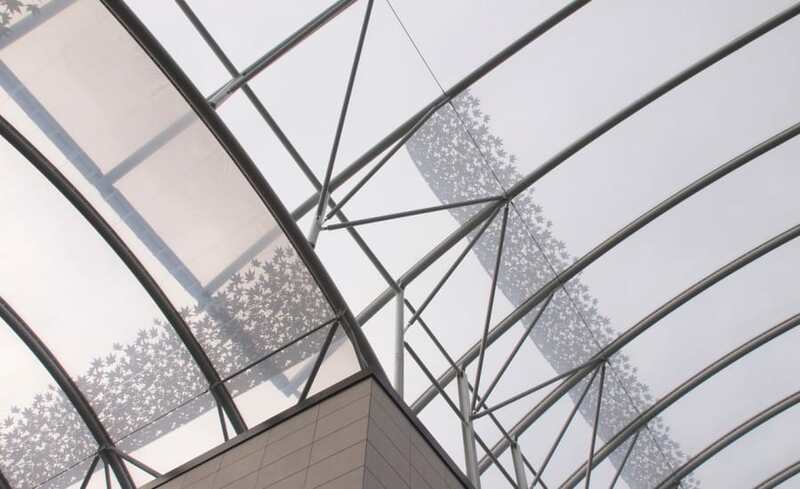 The fritting pattern, which is usually applied to help control light transmission and solar gain, is a purely visual statement drawing attention to the presence of the ETFE roof and creating a statement centre piece. Installation was carried using the elevated floor surface that formed a concrete roof to buildings below. Weight restrictions for this platform meant that specialist Spider access equipment had to be used for installation of the steel arches which span the street space. 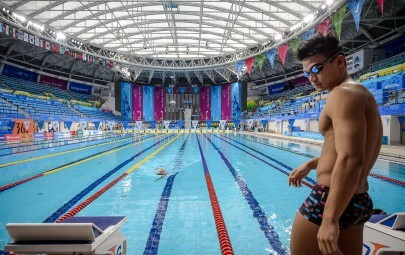 To enable a safe and efficient installation of the cushions, safety and working nets were installed between the steel trusses where the ETFE foil membranes could be laid out and attached before being inflated. In order to ensure the project was completed on time and within budget, there was the requirement for multiple activities to be happening alongside one another on site and other trades were working below our installation. As a result, careful co-ordination was essential between, Architen Landrell, Shepherd Construction Ltd and the other trades working directly below the installation. 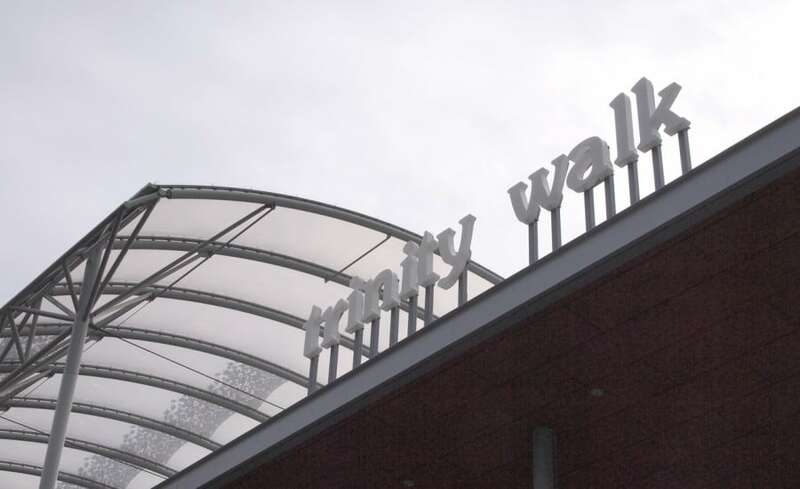 Despite its early hiccups, Trinity Walk became the first development of its kind to recommence since the onset of the economic recession and is now within the CACIs top ten shopping destinations. We are extremely proud to have worked on a project and the team welcomed the challenge of providing a structure of this size and complexity, within extremely tight deadlines.